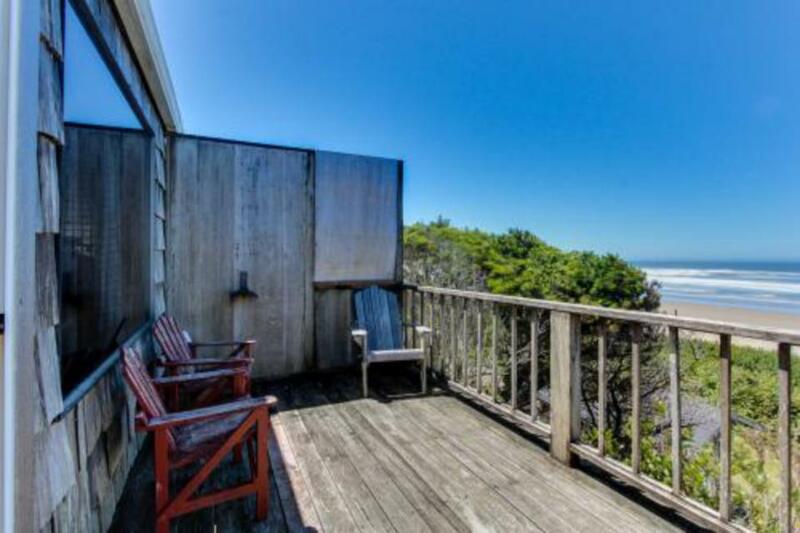 With two levels of living space, this Oregon Coast rental offers ocean views and a private deck overlooking the Pacific! Walk down to the sandy beach, or cook meals together in the full kitchen: with space for up to eight guests, you're sure to make memories here at the Cape Cod Cottages. This rental is made up of two smaller units, but can be booked together so you'll have plenty of space. The upper level is smaller, with comfortable seating and a kitchenette (mini-fridge, microwave, and coffeepot). There are two beds, one queen and one full, and a full bath. Downstairs is more space for everyone to gather: there's a living area has comfortable seating, including a hide-a-bed, a dining area, and a full kitchen. The bedroom on this floor has a queen bed, and there's another full bath here as well. Four guests can sleep upstairs, and four more down, along with two pets! There's a $10 fee per dog per day, with a $40 minimum per stay. WiFi is included for your convenience, too. Best of all, the beautiful Big Stump Beach is just steps from the door, with nearly six miles of sandy coastline to stroll every morning. Whether you're planning a family vacation or a getaway with good friends, you'll feel right at home at the Cape Cod Cottages.